Are you looking for a Saturday morning activity to do with your child? Look no further! Keep your kids dressed in their pajamas and bring them to Kids Garden Club for a free Saturday morning Pajama Playdate. The gym will be open for running, jumping and playing, which is a perfect way to let your kids burn off some of that weekend energy. A craft station will be set up for those kids who prefer doing something a little more artsy. And, a room will be dedicated specifically for babies 12 months and under and their parents. Donuts and coffee will be provided. Space is limited to 40 kids at Kids Garden Club for this playdate, so register soon! The conservatory space will be reserved for babies 12 months and younger and their parents. In the Conservatory, PHECA member and certified pediatric sleep consultant, Hilliary Giglio, will cover some basics about the importance of sleep and sleep needs of children. She will also share her core sleep tips (10:15-10:45am). This particular session will be limited to 10 babies plus their parents because of limited space in this room. 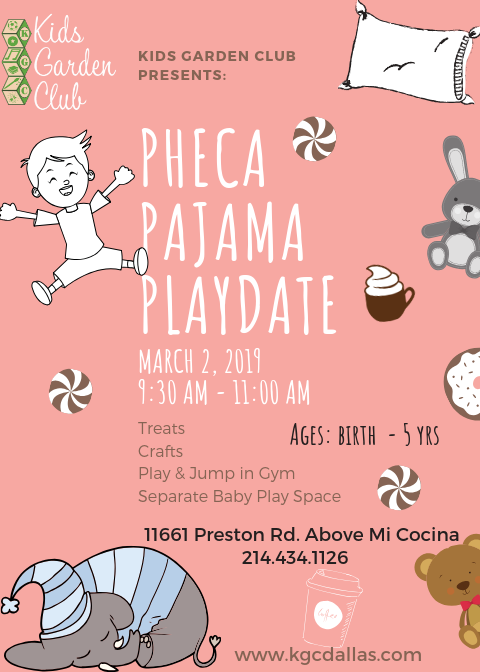 Please see the separate registration for this portion of the playdate, here: Kids Garden Club - Sleep Training session LIMITED Register early!